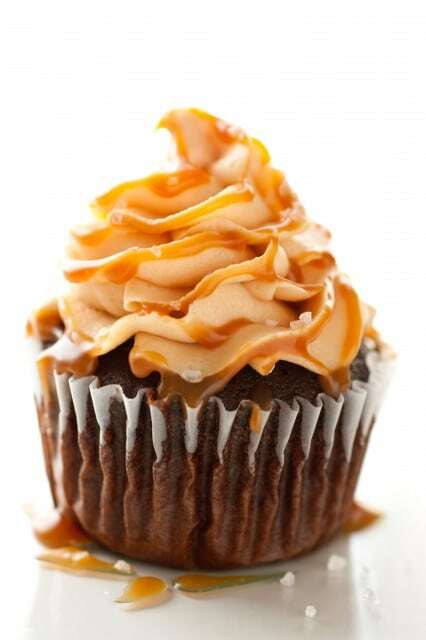 Chocolate Cupcakes topped with a rich Salted Caramel Frosting – it’s a match made in heaven! 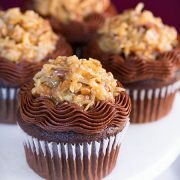 This will likely be one of the tastiest cupcakes you ever have sunk your teeth into! Rich chocolate paired with creamy luscious caramel with hints of salt – you just can’t go wrong here. Is it just me, or does butter seem to disappear almost as quickly as you get it home? I’m always opening my fridge to find that last stick of butter or sometimes worse, the last 2 Tbsp of butter – ahhh. That’s not going to get me far. I bought over six, one pound packages of butter last week. Already gone. Don’t worry, of course I didn’t eat all of what I make with that myself. Most of it I give to neighbors or friends. I cook a lot and bake a ton. A lot of that butter went to experimenting to create a delicious chocolate cupcake. I just recently posted a chocolate cupcake – just yesterday actually (the Almond Joy cupcakes) but I figured with all of that hard work in recipe testing I was going to get two recipes out of such a delicious chocolate cupcake =). Really you could frost the chocolate cupcakes with any frosting you wanted. You can use the fluffy vanilla buttercream I have posted, the chocolate cream cheese frosting, the chocolate buttercream frosting, or the cookies and cream frosting. But this time around, I wanted this to be a wow factor cupcake. An indulgent, melt away with each chocolaty bite cupcake. These are basically chocolate velvet cupcakes crowned with the most luscious caramel frosting. Their texture is so soft and so tender, and they are perfectly moist. I hate dry cupcakes and I hate spongy cupcakes so most likely you will never find any of the two here (unless it’s angel food cake). I tried different piping and frosting methods on these cupcakes. First I did the basic dome like frosting by hand and smoothed it with an icing spatula. I decided it definitely was not fitting enough for these cupcakes, as I think these require a fancy decoration to showcase such an intensely delicious cupcake. The second time around I piped the frosting with the 2D tip (my favorite) and didn’t know what to do with the caramel. I drizzled it over the top and it just turned it into a sloppy looking mess. Finally my favorite method was to pipe the frosting on, then drizzle the caramel along the edges of the lacy frosting. It may seem a little time consuming so if you don’t care about the look then simply frost them how ever you like. 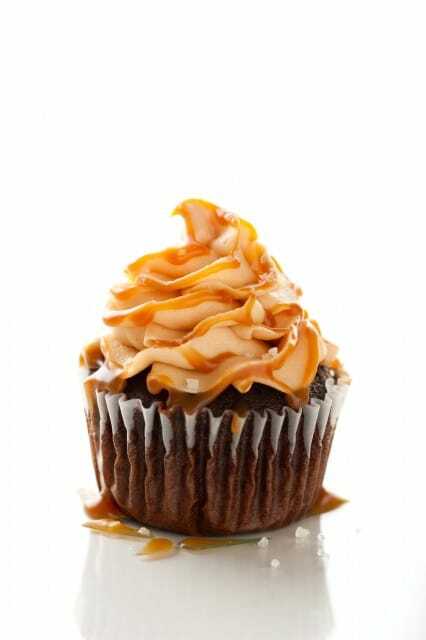 A quicker method would be to use the tip that I used on the Salted Caramel Apple Cupcakes I posted then drizzle the caramel over the top. How ever you decorate them, please just be sure you try these cupcakes. You wont regret it. Enjoy! Wanna bite?? Make them. Now =). it's a match made in heaven! 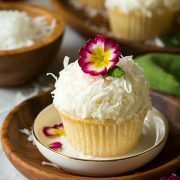 This will likely be one of the tastiest cupcakes you ever have sunk your teeth into! Rich chocolate paired with creamy luscious caramel with hints of salt - you just can't go wrong here. Preheat oven to 350 degrees. In large heat proof mixing bowl, whisk together cocoa powder and baking soda. Carefully pour in boiling water and whisk until bubbling subsides and mixture is well blended, allow to cool for 5 minutes. Meanwhile, in a separate large mixing bowl, using an electric hand mixer set on low speed, blend together melted butter, vegetable oil, granulated sugar, vanilla and salt until well combined, about 30 seconds. Stir in eggs and eggs yolks, mixing just until combined after each addition. Blend in cocoa mixture then blend in heavy cream. Slowly mix in flour and blend until combined, while scraping down sides and bottom of bowl. Divide batter among 24 paper lined muffin cups, filling each cup about 2/3 full. Bake in preheated oven until toothpick inserted into center comes out clean, about 18 - 20 minutes. Remove from oven and allow to cool in muffin tin several minutes before transferring to wire rack to cool. Cool completely then frost with caramel frosting, drizzle with room temperature caramel sauce (I poured the caramel sauce in a small Ziploc bag and cut a very small tip off end to drizzle) and sprinkle with coarse sea salt. Store in an airtight container. In the bowl of an electric stand mixer fitted with paddle attachment, whip butter on medium-high speed until pale and fluffy, about 3 - 4 minutes. Add powdered sugar and blend on low speed until mixture comes together. Add caramel sauce and vanilla and whip on medium-high speed until light and fluffy about 2 minutes. Gather all of your ingredients and have them nearby ready to add to the mixture as needed. In a heavy-bottomed 3 quart saucepan, heat sugar and water over moderately high heat whisking constantly to dissolve sugar. Once mixture reaches a boil, stop whisking and allow mixture to boil until it reaches a dark amber color, carefully swirling pan occasionally. Once mixture reaches a dark amber color, immediately add butter and whisk until butter has melted then immediately remove from heat. Wait 3 seconds then carefully pour in cream and immediately whisk to combine (it will bubble vigorously). Whisk until mixture is smooth. Allow caramel to cool several minutes then pour into a glass jar to cool completely and refrigerate.